Please note that the content of this book primarily consists of articles available from Wikipedia or other free sources online. Savannah Sanitoa (born April 30, 1987) is a track and field athlete who competes internationally for American Samoa. 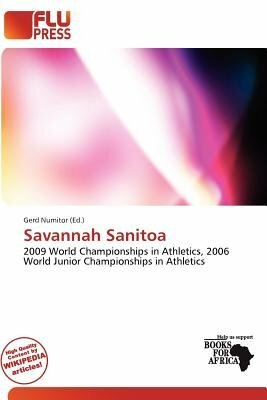 She is most famous for competing at the 100 metres sprint at the 2009 IAAF World Championships in Berlin.In 2006, Sanitoa represented American Samoa at the 11th IAAF World Junior Championships in Beijing. She competed at the 100 metres sprint and placed 8th in her heat without advancing to the second round. She ran the distance in a time of 14.56 seconds.